Transform your Android tablet into a mobile gaming system. The MOGA Pro Power features a powerful, rechargeable 2200 mAh battery that powers the controller and charges your phone while you play. An LED light indicates when your battery is getting low. MOGA Boost and micro-B USB cables are included for recharging. The included tablet stand securely holds your Android tablet at a slight angle, allowing you to set up and play anywhere. 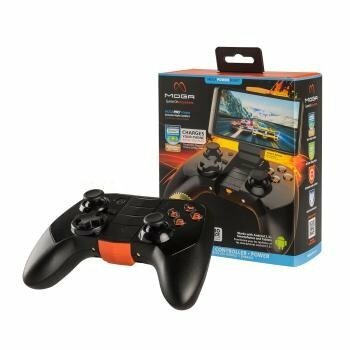 The MOGA Pro Power features full-sized console-style grips, dual clickable analog sticks, four action buttons, a directional pad, and L1/R1 shoulder and L2/R2 trigger buttons to deliver greater precision than your mobile device’s touchscreen. A four-way LED indicator shows you when your MOGA Pro Power is running low on battery. If your Android device has MHL out and your TV has an HDMI input, it’s easy to play your mobile games on your TV. Simply connect your Android device to the TV with an MHL-to-HDMI connector (sold separately), and you can play wirelessly with the MOGA Pro Power controller. For a more hands-on approach, the MOGA S.M.R.T. Lock Arm attaches the controller directly to your smartphone. The MOGA Arm uses S.M.R.T. Lock technology to securely grip your smartphone, transforming it into a handheld game console. MOGA Pro Power, tablet stand, 8-inch MOGA Boost cable, 3-foot micro-B USB charge cable, and instruction manual.